A major Chinese automaker has expressed its intention to invest in a project to build a car manufacturing factory in North Korea, the North’s media said Tuesday. FAW Group Corp., a Chinese state-owned automotive manufacturing firm, signed a letter of intent last week with North Korea’s Rason regional government to invest in the construction of the factory, the North’s Korean Central News Agency (KCNA) reported. The agreement is a preliminary step to conclude an official deal for the investment. The deal was made during the third round of the exhibition for international goods held in the North Korean city last week, according to the KCNA. The impoverished communist country designated Rason, located on its northeastern tip, as a special economic zone and has been actively seeking an overseas investment in the region. During the exhibition, China’s Heilongjiang regional committee on trade promotion and Rason’s economic committee signed an agreement to boost cooperation. Heilongjiang province is located in the northeastern part of China. Stressing Chinese firms’ investment in the Rason region, an unidentified official from the Chinese body vowed “to transport goods from its region to Shanghai via Rason ports,” according to the report. 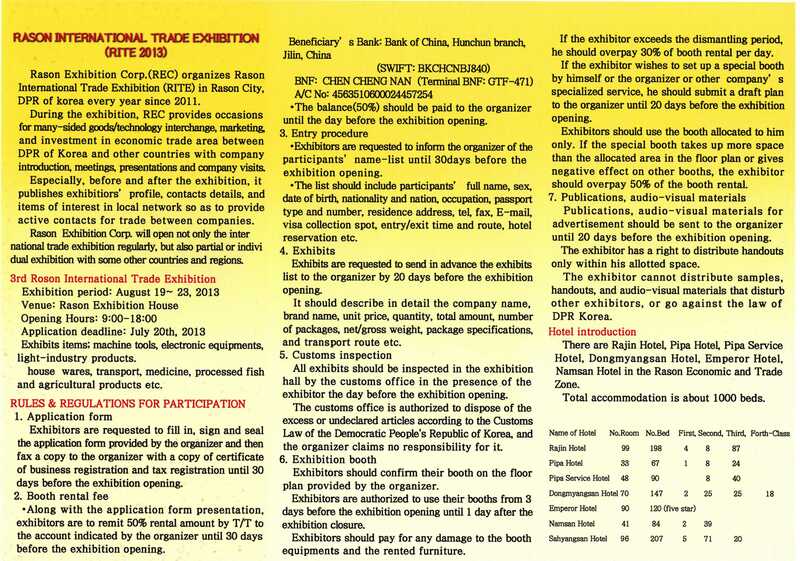 Pyongyang, August 21 (KCNA) — The 3rd Rason International Trade Exhibition is going on in the Democratic People’s Republic of Korea. The exhibition in the Rason Economic and Trade Zone bordering China and Russia is attended by more than 120 entities from countries and regions, including the DPRK, China, Russia, Germany, the U.S., and Japan. On display at the exhibition are some 78 000 items of exhibits in 410 kinds, covering machinery, steel, electrical, electronic and chemical products, foodstuffs, medicines, building materials, vehicles and sundries. In this regard, KCNA met Hwang Chol Nam, vice-chairman of the Rason City People’s Committee. The Rason City has laid definite institutional guarantee and legal foundations for jointly developing the economic and trade zone and has made a big stride in building infrastructure, paving a way for foreign businesses to smoothly carry on production and trade in the zone. 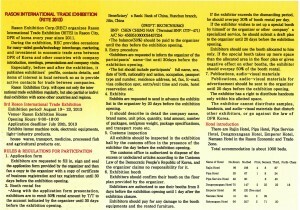 During the days of the exhibition, foreign businessmen will witness the situation of the developing zone. Ho Myong Ho, director of the Rason Exhibition Corporation, told KCNA that the current exhibition is the biggest in scale and he believes that it will serve as an occasion for making the trade in the zone gain momentum. The exhibition will run until August 23. 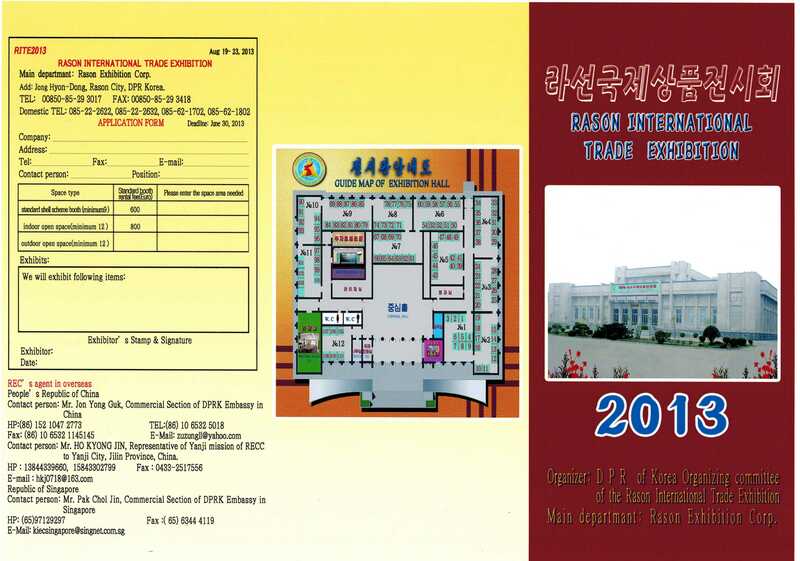 The Rason Economic and Trade Zone is a special economic zone in the DPRK, where preferential treatment is available. The zone has developed into a hub for transit transport, trade and investment and financial and tourism service. 2013-8-20 evening news coverage of the opening ceremony can be seen here. 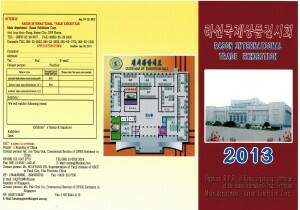 Previous posts on the Rason International Trade Fair can be found here. This entry was posted on Wednesday, August 21st, 2013 at 6:29 pm and is filed under China, Foreign direct investment, Manufacturing, Rason International Trade Fair. You can follow any responses to this entry through the RSS 2.0 feed. Both comments and pings are currently closed.